Technically, my first plane was a HobbyZone Aerobird. That’s an entire story in itself. Let’s just say I went through 2 fuselages and about 6 sets of wings. But I eventually learn to fly it pretty darn well! After mastering the Aerobird, I set my sites on a glow powered trainer. After pouring over the internet for weeks searching for the perfect trainer, I finally decided on the Sig LT-40 ARF. Great choice! At the time, my idea of an Almost Ready to Fly plane was not very realistic. My plan was to pick it up at the hobby shop, put it together really quickly and head to the flying field to find an instructor to help me with a buddy box. The hobby shop owner handed me the box, and I said “No, I want the ARF not the kit.” He grinned and replied “This is the ARF son, a kit is just a box of balsa with instructions…” Yea, I felt like a chump. I really enjoyed putting it together, even though it took me a week instead of a couple hours like I had planned, lol. The instructions were very clear. Even though it was my first ARF, I had no problems putting together. All the hardware, wheels, engine mount , tank, an everything else I could possibly need was in the box, except the glue, knives, etc. Spending a week putting it together really gave me a chance to bond with the plane. Even though I knew how to fly the Aerobird in my sleep, I decided that it would be a good idea to join a club and get some assistance with a glow trainer. It was such an awesome feeling to watch her take off and rise to the sky as my instructor took her up for the first time. What a proud moment! After he got her trimmed, he handed the control over to me. Oh man, talk about an adrenaline rush. My heart was in my throat the entire time! But it was really easy to fly. The plane is absolutely huge, so it wasn’t a problem seeing it, that’s for sure. It was powered with an Evolution Trainer system with the three bladed prop. It had plenty of power for getting off the ground, and it floated in for a landing like a feather. It only took about 3 flights before I was off the buddy box, because I had already learned the basics with the Aerobird. After a couple of weeks I replaced the three bladed prop with a standard propeller. I also removed the flywheel. Holy Cow, it was like I had a brand new engine with twice the power! I burned the sky up! I absolutely loved the Sig LT-40. I would recommend it to anyone because it’s nice and big, easy to see. It’s a very stable airplane and floats like a feather, giving plenty of time to think about what your doing. The tri-cycle landing gear makes it a breeze to take off and land. It’s a quality sturdy built airplane. And, it’s really easy to put together and includes everything needed. You can’t go wrong with the Sig LT-40! I would have to agree that the LT-40 has to be the best trainer out there. I'm an instructor and have seen quite a few trainers, and I'm most impressed with the LT-40, for all the reasons you mention above. Don't get me wrong, they're a lot of good trainers out there. This one just happens to by my favorite! In my opinion, the LT40 is the best trainer on the market. Have to agree it is a beautiful trainer and still one of the best on the market. Did not purchase the ARF version assemble the LT-40 kit not the ARF version. Instructions were very good, assembly time 65 hours. Did beef up the frame and install dowel rods thru the wings and bolt holes to attach the wings to the frame by using 2 x nylon bolts. Very simple modification on the LT-40 frame. Enjoyed the assembly of the LT-40 took some time provides an opportunity to learn the air frame and characteristics of the LT-40 and allows for a understanding how servos work. Beautiful airplane to fly. Installed a .72 OS 4 stroke with a 3 bladed prop. Training was done by Ray Smith in 2000. For four days 2 hours per day 150 touch and goes per day. After 14 years of flying the LT-40 (Note never fly less then 5 days per week)The airframe is still in original condition, air frame repairs have not been required. The air frame has logged 7,385 hours as of August 01, 2014. Over a 14 year period. Still fly the LT-40 and do a minimum of 70 touch and go landings in a one hour period then free flight time for one hour in the LT-40. Great airplane for dead stick since it likes to float like a kite. Has a very low stall speed makes for a perfect trainer and recreational flying. Performs well in 10 MPH to 15 MPH winds behaves very well in windy conditions. Barrel rolls with a little nose down attitude, loops and hammer head stalls the LT-40 goes exactly where you point it. My LT-40 wet weighs 8 Lbs 14 ounces with a O.S .72 4 stroke. 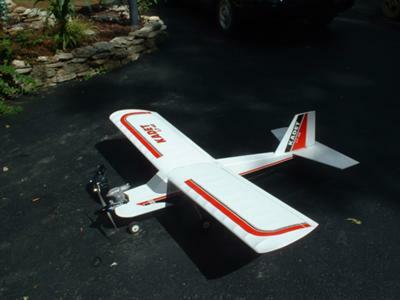 This is my first RC airplane as others have mentioned you have a special feeling for the first RC you fly.